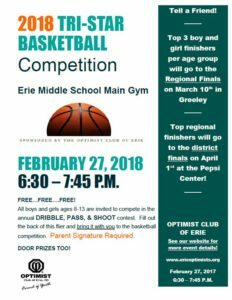 All boys and girls ages 8-13 are invited to compete in the annual DRIBBLE, PASS, & SHOOT contest. 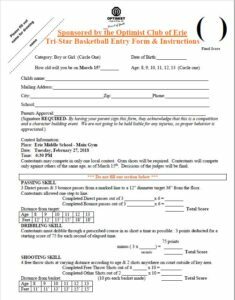 Fill out the back of this flier and bring it with you to the basketball competition. Parent Signature Required. Top regional finishers will go to the district finals on April 1st at the Pepsi Center! See our website for more event details! Contestants may compete in only one local contest. Gym shoes will be required. Contestants will compete only against others of the same age, as of March 15th. Decisions of the judges will be final. 3 Direct passes & 3 bounce passes from a marked line to a 12” diameter target 36” from the floor. Contestants allowed one step to line. 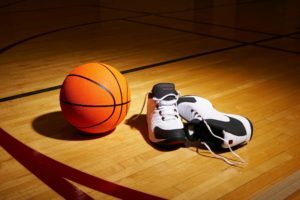 Contestants must dribble through a prescribed course in as short a time as possible. 3 points deducted for a starting score of 75 for each second of elapsed time. 4 free throw shots at varying distance according to age & 2 shots anywhere on court outside of key area.